Let is be said that I’m not pro piracy and I’m very much against skewing facts to suit your own cause. The title is the ninth commandment and though not a strong believer my self I do believe in fact that we need certain rules for society to function. The ability to detect when people are cheating is actually by nature viewed as extremely important, important enough that our logic genetically is shaped for this. Even since the dawn of Napster we’ve had stories about music and movies and how that has impacted the earnings of the Music and Movie production industries. How markeds are affected or not affected by external changes, in this case the emergence of new technology is pretty hard to prove and often is just speculated. However once in a while the empirical evidence points strongly in one direction but when that direction is counter-intuitive it becomes easier to disregard it. The evidence that supports the musicians did not suffer dues to piracy is abundant. Take the research article “The Swedish Music Industry in Graphs, Economic Development Report 2000 – 2008″ which concludes that in that period earnings of the musicians grew 35%. As a whole the industry earnings stayed at the same level in that period, with the record companies as the only users. The copyrights organisations send more money to the rights owners not less. But the record companies suffered a massive set back from 1700 mio SEK to 800 mio SEK and just who has wage wars against file sharing? well some musicians but mainly the production companies. The study is not on the global marked but only the swedish marked but when talking about piracy a notable marked since the most know torrent tracker the pirate bay origins from Sweden. Interestingly enough April 2003 was when iTunes was launched. Skipping a few years a head to 2008 where the first beta of spotify was released it was soon realized that was a serious competitor to pirated music and a study by Swedish Music industry supported this and in 2009 it was found that the number of people who pirate music has dropped by 25 percent and the sharp decrease coincides with a the interest for the music streaming service Spotify. Could it be that the recording industries slow adaptation to change is the real culprint? At least that wouldn’t be the first time. The same industry proclaimed that radio would kill music but three years ago tried to make FM receivers in cell phone manadatory. The radio didn’t kill the music on the contrary radio has been one of the best places to advertise music. Record labels rutinely supply and will even pay to have music played at the right time, some contradictory to what the industry proclaimed radio revitalized the recording industry when the industry adapted to the change. The above cited study that found that music pirates buy ten fold as much as there non-pirate counterparts also found that the two of the main reasons the sales have gone down are that with digital downloads you no longer buy bulks of music aka albums but cherry pick the numbers you want and simple apathy. Spotify and Netflix and the like have shown how the industry can adapt to the change and the latest numbers show that people follow. Just as the availability of digital downloads (iTunes and others) had an impact on piracy so does the increased availability that spotify brought to the marked in 2008. In general supporting that the key factor is not the price. It’s not that it’s free that’s the reason why so many have turned to piracy but the availability of the desired products (E.g. hit single vs. Albums with hit single). Do I think piracy might have played a part, it’s intuitive that it has and sounds reasonable yes but on the other hand it’s also counterintuitive that you can make money by giving away your products but the history of open source software proves otherwise and it’s just as intuitive that no one would accept to buy 14 liters of yoghurt to get the one flavor you really liked and 13 you kinda liked but never really got to consume. Anyone in that situation would go to where you could just by the 1 liter you desired. Would that be visible on the yearly revenue of the diary industry? of course it would! As I started out by saying do I support piracy, no I don’t it’s illegal. Do I to some extend think the law that defines copying information as flawed, yes I do. Do I think it’s the main reason to the problems the recording industry have had? Not really, I think it’s the availability (or lack thereof) that’s the real reason. A statement that’s supported by Mike Lang, CEO at Miramax: “The music business is suffering because it allowed too few players to flog content, presumably fearful of their content being stolen. 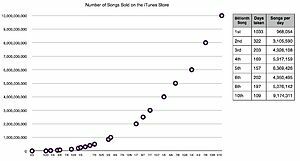 Encouraging Apple’s iTunes at the expense of others is effectively strangling the industry” and with spotify and others it would seem that the recording industry it self are starting to pay attention to that. No one knows what the revenue statistics would have been if the recording industry instead of spending billions on fighting the tide of changed had spent those money on adopting to change, listening to the demands of their customers? But with the latest numbers that shows an industry in progress largely due to services such as Spotify and Netflix history repeats it self. Radio didn’t kill the music and neither will the internet. Who’s knows perhaps sometime in the future music might die and history tells us the most likely cause will be the industries lack of will to adapt to change.